The hand crafted greedy fish bottle stopper in pewter and finished by hand with paint and cork. Glug, glug, glug….that was the sound being made as we wrote this 🙂 wine glorious wine and it reminded us of our wine hogging friend the greedy fish who’s both is soooo big it fits over the kneck of a wine bottle. That concerned so much, we put a cork in it. Ha! This strange stopper is designed and made in the UK and has a few admirers. 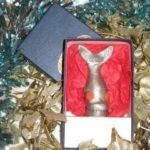 It was given life at the hands of create folks who designed and then fashioned it out of solid pewter, gave it a natural cork stopper and then with swift stroke of the hand it was painted. This is the sort of gift for someone a little quirky, whose into water based things and probably fish, they’ll love the effort you went too to find this oddity novetly stopper instead of forking out for that factory mass produced stuff. Oh and if you’re still left a little perplexed and have a burning question then pop it on the live chat box, pick up the phone or email it in and we’ll get on the case.